"The gospel has no permanent resident culture." A good friend of mine recently gave me a copy of the African Bible Commentary. I've wanted one since it became available over a year ago. 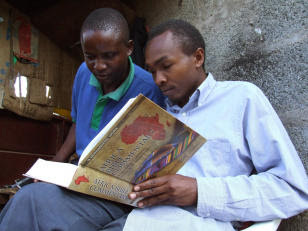 It is a one-volume whole Bible commentary with entries from 70 African scholars. These highly competent men and women (most have PhDs from highly prestigious schools) present a commentary from their culture and worldview. These African scholars invite us westerners to look beyond the confident, often arrogant results of our biblical study skewed as it is by western cultural limitations. Kwame Bediako, PhD in Divinity from the University of Aberdeen, Scotland (as well as PhD in French Literature from the University of Bordeaux, France) wrote an opening article for the ABC titled "Scripture as the Interpreter of Culture and Tradition." While Kwame Bediako's entire article is immensely stimulating, one sentence by this African scholar leaped from the page, grabbed my mind and pinned it to my desk saying, "Think!" Kwame Bediako wrote this simple, stunning sentence: "The gospel has no permanent resident culture" (ABC, 4). The gospel doesn't reside in western Michigan or Wheaton, IL or Dallas, TX, or Colorado Springs. The gospel isn't exported with American missionaries to other countries. The gospel is nomadic, a God-created gypsy, a "word" without a country, yet comfortably at home in all cultures. Why did this sentence stun me? Because it socked me in my fat American arrogance. Bediako humbled my supposed theological superiority. His precise sentence was a crow bar that pried away my culture-bound grip on the Americanized "good news." We live in a truly startling moment in history (no matter how you feel about USAmerican politics). We live in a time when clear, strong voices "from [almost] every tribe and language and people and nation" are helping to shape a global gospel and an international theology that are not hide-bound by any one culture. Western gospel empirialism is fading fast. To God be the glory! Thanks for highlighting this commentary. Western hegemony and monologue is on the verge of cracking into a thousand pieces. Wonderful to hear the voices of our brothers and sisters from distant lands as we seek to live the sacred text in the space of the gospel, which transcends cultural boundaries and diversity. I am sure you are closer to the "cracking up" process than I am. I like your words "to live the sacred text in the speace of the gospel." Beautiful. I got your website from Scot McKnight's excellent blog. Thanks for stopping by. I am enjoying the ABC. It's a wonderful tool for study. Amen, John. Hopefully they'll still need us somewhere along the line.